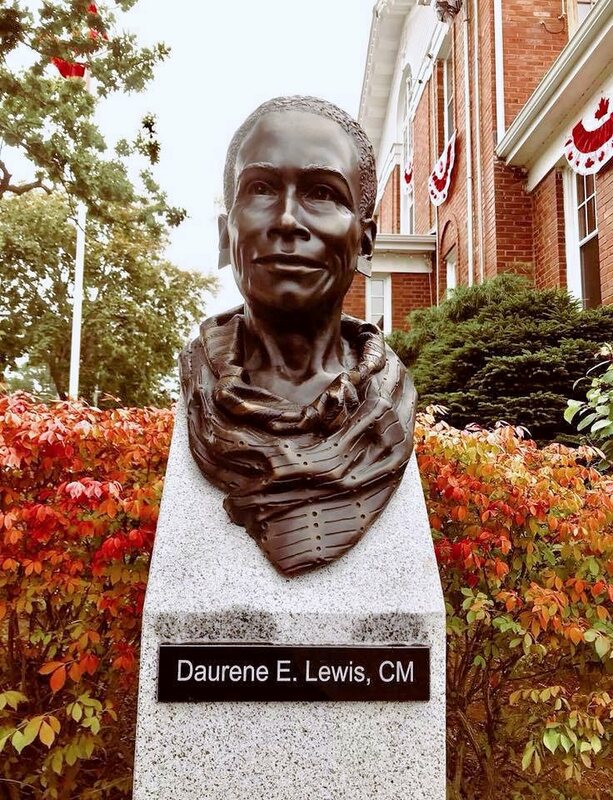 Portrait bust of Daurene Lewis, commissioned by the Town of Annapolis Royal, Nova Scotia. This project was initiated by Mayor Bill MacDonald, Mayor of Annapolis Royal in 2018. A native of Annapolis Royal, Daurene Lewis was a 7th generation descendant of Rose Fortune, one of more than 3,000 Black Loyalists who arrived in Nova Scotia in 1783-4. Daurene Lewis was elected mayor of Annapolis Royal in 1984, becoming the first Black mayor in Nova Scotia and the first Black female mayor in Canada. She is also an accomplished textile artist. She fell in love with the family tradition of weaving and had her own shop in Annapolis Royal. Daurene earned her Registered Nurse diploma from Dalhousie University and a Master's of Business Administration degree from Saint Mary's University. Lewis's numerous awards include an honorary degree from Mount Saint Vincent University (1993), Nova Scotia Black Cultural Centre's Wall of Honour (1994), the United Nations Global Citizenship Award (1995); the Progress Club of Halifax Woman of Excellence Award for Public Affairs and Communications (1998); YWCA Volunteer Award (2002), Queen's Jubilee Medal (2002), and was named a Member of the Order of Canada (2003).